The ultimate guide to chargers designed for use on the go. 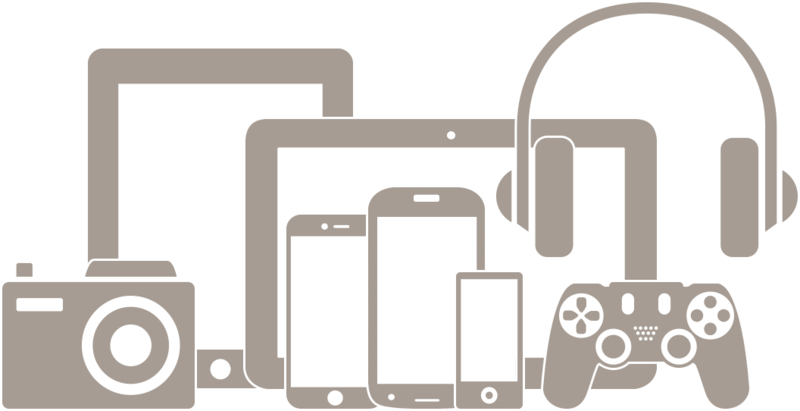 Mobile devices like smartphones and tablets make life so much easier. That is, until they run out of battery power when there’s nowhere to plug in. The answer is a portable charger. 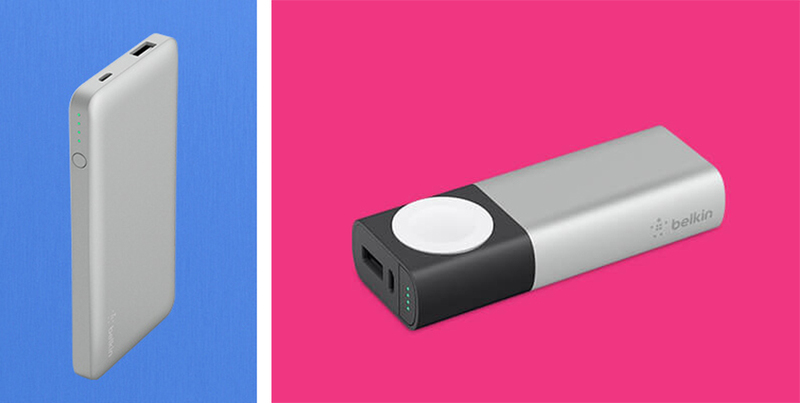 A lightweight power bank or mobile battery pack that you can carry anywhere. They go under different names: battery packs, power banks, portable chargers, fuel banks, pocket power cells and back-up charging devices to name just a few. But whatever you call them, they all do the same thing. Charge your phone or tablet without needing a power outlet. Simply charge it up at home, throw it in your bag or your pocket, and connect it to your phone whenever it needs a quick battery boost. You’ll never suffer from “low battery anxiety” again. 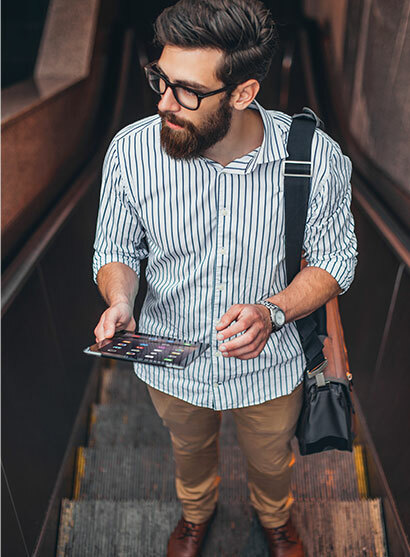 Make sure you’re always connected with back up battery power that’s as mobile as you are. Battery packs come in all shapes and sizes, smaller sizes for an essential smartphone boost in your pocket, or bigger sizes for multiple charges or to charge a tablet. Choose one with cables included, or one with multiple ports to charge more than one device at a time. 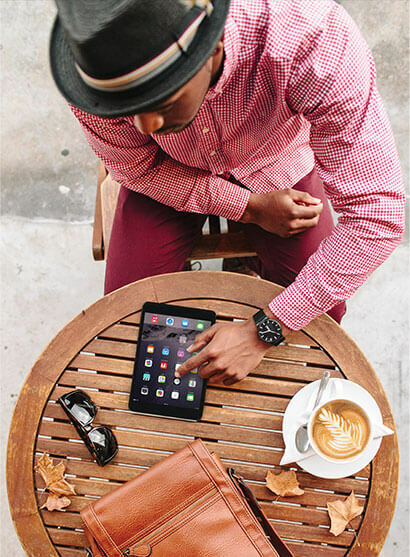 Pick out a power fortress or something small and sleek, and take the power to charge anywhere, with you everywhere. Start by choosing the size of your battery (aka power bank). Common sizes range from 2000mAh up to 10,000 or even 12,000 mAh. 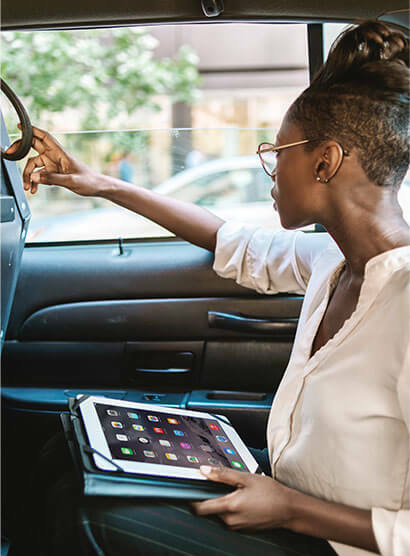 Bigger numbers mean more power, which means more recharges for your smartphone, or charging for bigger devices that need more power, like a tablet. Charges an iPhone 7 (running iOS 10) up to 1.5 times on a single charge in internal testing. Charges an iPhone 7 (running iOS 10) up to 3 times on a single charge in internal testing. We’ve used smartphones and tablets to compare battery sizes, but most battery packs will charge any device that charges via USB, such as a GoPro camera, Kindle reader or Bluetooth headset. Bigger devices that draw more power will need bigger batteries - more mAh - to charge them fully. 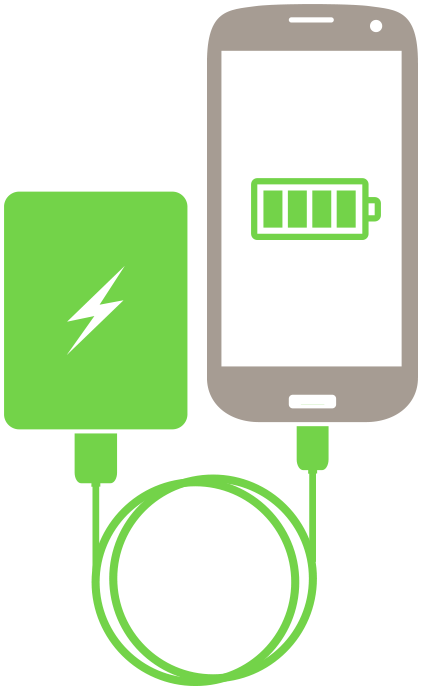 How to ensure fast charging for your phone/tablet. Technically the standard USB port on your battery pack (aka power bank) will fit any standard USB cable. However, the amount of power it can provide may vary. 1 AMP/ 5WATT A 1 amp USB port will charge your smartphone or tablet but may charge slowly, even if the battery is big enough to charge your smartphone more than once. 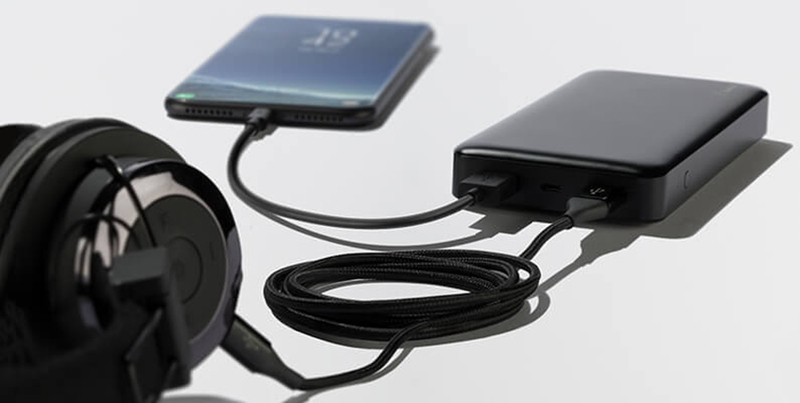 (shared*) If you connect two smartphones, or a smartphone and a tablet, it will charge them both, but probably not at the fastest possible speed. This has the power to charge 2 smartphones, or a smartphone and a tablet, simultaneously at the fastest possible speed. If you connect 2 tablets, it will charge them both, but probably not at the fastest possible speed. (shared*) This has the power to charge 2 tablets simultaneously at the fastest possible speed. How many devices do you need to charge? 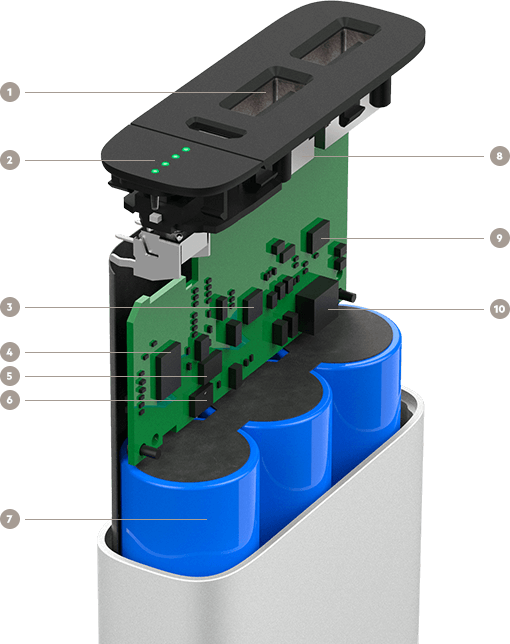 Bigger batteries (aka power banks) – with more mAh – sometimes have more than one USB port, because with all at that power inside, why not share it out? This can be useful to charge two smartphones at the same time – maybe to give a battery boost to a friend. Or you can charge your smartphone and your GoPro at the same time. Or your smartphone and your Bluetooth headset. Or even a smartphone and a tablet, if you choose a battery with enough mAh to provide all that power. 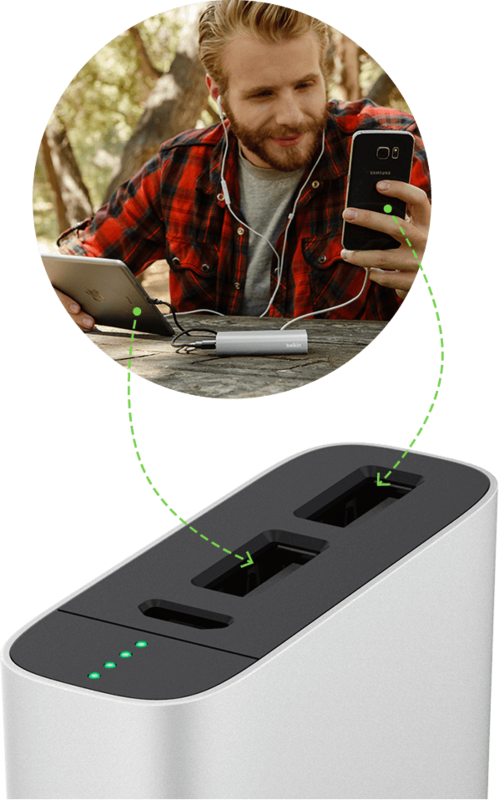 With multiple ports, simultaneous charging is super-easy. The quality of your cable can help to determine how quickly your power bank (aka portable charger) and attached devices power up. Higher quality cables also protect your devices from overheating and harmful power surges. Every power bank (aka portable charger) needs to be charged. This usually requires a standard USB to Micro-USB cable. Simply connect your power bank input port (usually Micro-USB) to a standard USB wall charger. Most power banks (aka portable chargers) charge via a USB port, simply connect your device to the USB port and begin charging. Some power banks come with a cable, or a variety of cables, that are detachable. This makes it easy to switch between cables for your iPad, your Samsung phone, or other device. Other power banks have a cable hard-wired to the pack. This prevents losing the cable, but makes the power bank less versatile overall. There is no such thing as a magic battery pack. Unfortunately, no battery pack has been invented that magically recharges itself when it’s empty. But on the whole, they are pretty simple to charge. 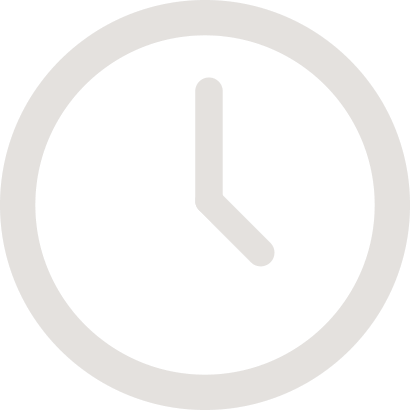 If you need one immediately, check on the package if it’s ready to use when you buy it. Some will need to be charged at home before they can be used. To charge, plug the supplied cable into the input port on the battery pack. Attach the other end, usually a standard USB, into a wall charger or other power source. 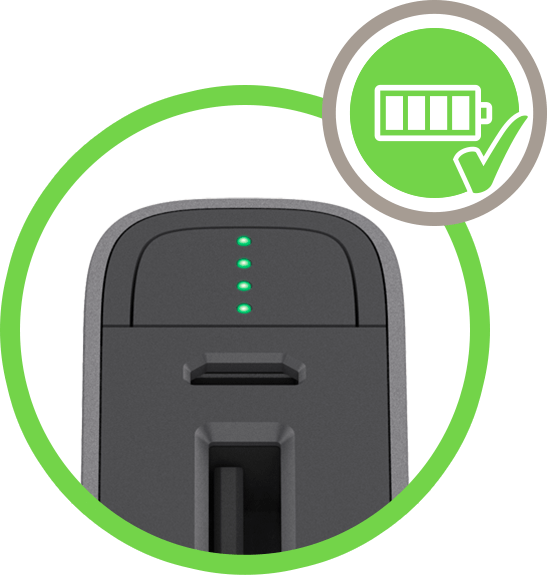 Battery pack input ranges from 1Amp up to 2.4Amps. Put simply, the bigger the input number, the faster it will recharge. Most wall chargers deliver up to 2.4Amps, but it’s worth checking the charger if you’re in a hurry, as a 1Amp charger might take twice as long. Some battery packs have an LED indicator, which tells you how much power the battery pack has left. This will tell you when you need to recharge the battery. A power bank (aka portable charger) seems like a good idea. But is it safe? Some power banks are carefully designed and rigorously tested to offer complete peace of mind, that is backed up by robust warranties and guarantees. 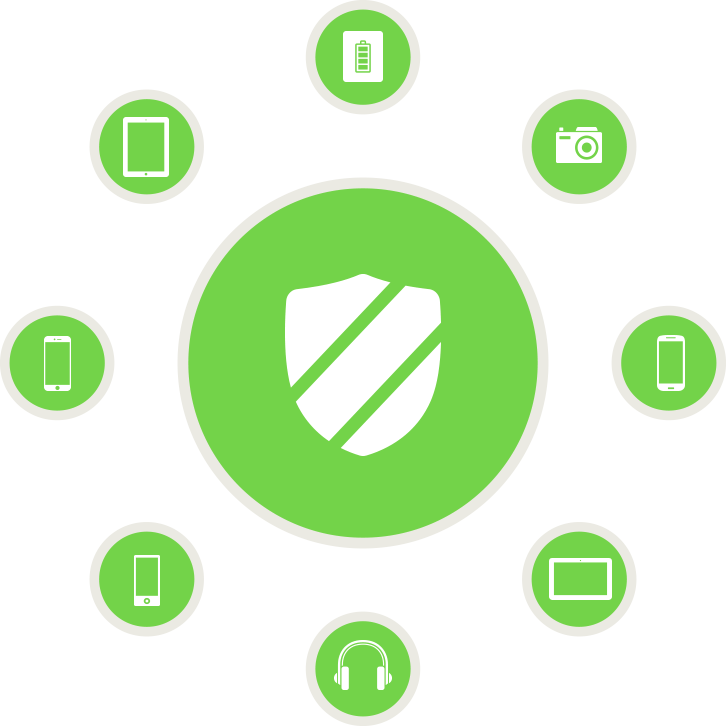 Some warranties protect the power bank itself, while others also safeguard the electronic devices you attach to it, like your phone, tablet or smartwatch. Some batteries might not offer such peace of mind. Opting for low cost or counterfeit products can turn out to be expensive, even dangerous. It’s easy to avoid this by following these simple steps. Some power banks (aka portable chargers) require you to register your purchase, by providing the serial number either online or via a helpline. This is a good way to activate your returns policy and ensure your product is not a counterfeit. Covers the power bank (aka portable charger) for a specific period from the date of purchase, and usually requires you to keep your receipt to prove purchase date. Covers the power bank (aka portable charger) for the reasonable life expectancy of the product, which may vary according to manufacturer. 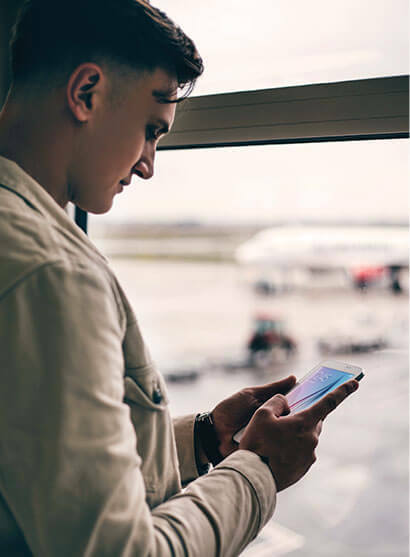 A more robust warranty which not only covers the power bank (aka portable charger) itself, but will also offer to repair or replace devices that are damaged while “properly connected” to the power bank, in line with manufacturer guidelines. Such warranties usually have a clause stating up, “up to $1,000” or similar. The amount should be enough to cover the types of device recommended for use with the power bank, such as a smartphone or tablet. A robust quality assurance offers durability and peace of mind. Rigorous testing and thorough investigation of product performance make your battery pack more likely to last longer, and less likely to harm you and your valuable electronics. More efficient battery packs will have a lower operating temperature, which wastes less energy, giving it longer life expectancy. OCP prevents too much power going into the battery pack and the power going out to the connected equipment, protecting the delicate circuitry of both devices. Like OCP, OVP protects both the battery pack and the connected device by keeping the voltage within recommended safety parameters to avoid damage. High-performing batteries should not be overcharged or fully discharged to prolong their life expectancy. Some battery packs consistently monitor charge states to prevent this from happening. While using batteries in extreme temperatures isn’t advised anywhere, it can be a good indicator of weaknesses in design and construction. Batteries which pass such stringent testing will be more durable and offer improved assurances of overall safety and performance. Compliance with legal standards of safety. These logos or marks, usually found on the packaging, will indicate that they have passed the necessary industry standard regulations, to comply with and achieve the following certifications. To learn more, please see CHARGE ANYWHERE above, or The Cheat Sheet below. While many battery packs may look identical, when it comes to safety, it’s what’s inside that counts. mAh stands for Milliamp Hours and quantifies the energy storage capacity. It is based on how long a battery will last when power is drawn constantly, e.g. a 2000 mAh battery will power a device drawing 100 mAh for 20 hours. Short for ampere, this is a unit of current, not a unit of charge. It describes the constant and average current that passes through the circuit. Shared power banks will provide power where it’s needed, e.g. a 2 x 1.7A [3.4A shared] will charge two smartphones at 1.2A each, or one tablet at 2.4A. Some multi-port power banks (aka portable chargers) will have fixed outputs on each port, e.g. a 2 x 1.2A [2.4A total] and will charge two smartphones at 1.2A. This is what is referred to as, “total” power. A mobile phone with an advanced mobile operating system, usually with internet access, touchscreen interfaces, cameras, media players and the ability to run third-party apps. A mobile computer with a touchscreen display, circuitry and battery in a single, portable device, usually featuring pop-up, virtual keyboards for typing. Short for Universal Serial Bus port, a USB port is designed for use with an industry standard connector to communicate data and supply electric power between devices. The most common, universal connector on the “other end” of most current USB cables, is a USB-A. These are often suitable for use with computers, car chargers, wall chargers, and many other devices. Micro USB is a USB connector that is smaller than USB-A, and is often found on smaller or thinner mobile devices, such as android smartphones, digital cameras, battery pack input ports, Kindle readers and many others. USB-C is a new type of USB connector, hailed as the new standard. Smaller, faster and more user-friendly than previous USB types, USB-C has widespread support from industry leaders, meaning that USB-C will come to replace all other USB types. A connector developed by Apple to replace the 30-pin connector. Used across all iPhone, iPod and iPad releases since iPhone 5, iPod Touch (5th generation) and iPad 4th generation.